Members of the TRUCE Steering Committee, both past and present, gathered in November, 2014 at Wheelock College in Boston, MA to celebrate TRUCE's 20th anniversary. 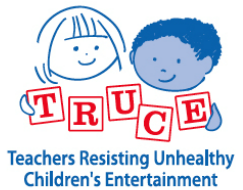 TRUCE Supports Campaign for a Commercial-Free Childhood Efforts to Prevent Ronald McDonald from Appearing in Schools. Read TRUCE's letter to McDonalds, July 29, 2014.